Paleontologists suggested some new twists on tectonics and ecosystems at the annual meeting of the Society of Vertebrate Paleontology (SVP), held mid-October in St. Paul, Minn. Their ideas might offer answers to some key conundrums regarding extinction, speciation and the global distribution of vertebrate species. The Paleocene-Eocene boundary, about 56 million years ago, marks a particularly busy period of change on Earth. A large ocean extinction event, attributed to a massive expulsion of methane gas, marks the boundary. Isotope measurements indicate a brief warming period in high latitudes at the time, lasting for a few million years. The modern orders of mammals appeared, soon developing into distinctly different species in North America and Europe, after the two regions had been similar for a short period of time. But geologists have been hard pressed to determine what might have caused such upheaval. Malcolm McKenna, a paleobiologist affiliated with the University of Wyoming and the University of Colorado Museum (and formerly at the American Museum of Natural History in New York City), has been considering the configuration of the continents in order to find a new possible scenario. In his presentation at the SVP meeting on Oct. 16, McKenna discussed a dry land corridor, formed by a proto-Iceland, joining the North American and Eurasian continents and separating the Arctic Ocean from the Atlantic. The net effect is "Lake Arctica," the opening of which would have been catastrophic. According to McKenna's scenario, the only outflow from the Arctic at the time was through the Turgai Straits, a relatively thin but long body of water extending south, along the eastern side of the Ural Mountains of Russia. The only water flowing into the Arctic were from freshwater rivers on the continents. "If runoff from the continents was about 2,500 cubic kilometers per year," as it is today, McKenna says, in less than 100,000 years and as little as 50,000, that input could have turned the Arctic Ocean into freshwater, as other researchers have shown. With the only exit south, and no warm water traveling north to the Arctic, the ocean probably dumped cooler brackish water (or possibly freshwater) down the Turgai Straits. Then, as the North Atlantic seafloor spread rapidly, "within a million years or so after the Icelandic bridge formed, it broke apart again," McKenna says, "and Iceland could no longer choke the whole area." The flood of relatively fresh water southward when the bridge broke would have resulted in biological as well as geochemical upheaval. The rejoined Arctic and Atlantic oceans would have had odd isotopic signatures, as colder freshwater and warmer saline water mixed. Also, "deep warm water flooding into the Arctic would have disturbed methane clathrates," McKenna says, providing an explanation for a short global-warming pulse  that researchers have hypothesized could be caused by a massive methane burst. McKenna also draws on dust particle size studies and isotopic changes in places like Wyoming, as well as in the world's oceans. Moreover, McKenna says, a freshwater Lake Arctica would provide an ephemeral highway for freshwater fish, explaining the presence of genetically related species in both Chinese and American Eocene lakes. "It's an idea I certainly don't dismiss immediately," says William Clyde, a mammal specialist in the time period at the University of New Hampshire in Durham, "and it has some intuitive value." It might explain some odd patterns, he says, including a very short but intense global warming, a concurrent big extinction of benthic foraminifera, a major introduction of new land vertebrate species and warm temperatures at high latitudes. "The world was very different at this time," Clyde says. "There's clearly an anomalous event at this boundary." Lance Grande, an evolutionary biologist at the Chicago Field Museum, calls McKenna's proposal "an interesting perspective" on the biological relationships between different continents. However, he says the idea is as hard to prove as any other explanations on the table  including the proposed "Pacifica" continent attached to Australia, which, after it broke up, could have "rafted" exotic terrains carrying the same species to Asia and North America. "Either explanation, McKenna's or Pacifica, would be very difficult or impossible to prove or disprove," says Grande. And, though analogs of a saltwater body with freshwater on top exist today (such as the Great Salt Lake), Grande says "it's hard to envision a stable system as large as the Arctic Ocean." McKenna suggests the answers may lie in proprietary drill-hole data from oil companies in the area. "We should be searching for freshwater or very negative isotopic values in the North Sea" from that time, he says. "Someplace where cores penetrate rocks of the very latest Paleocene, I would predict that there would be a spike of freshwater." If such an excursion in the rock record exists, it could support a new boundary between the Paleocene and Eocene. Paleobiologists have long accepted the influences of tectonics and climate change on the rise of new species and their extinction. But at the October SVP meeting, scientists made that connection even more apparent, providing a model predicting levels of genetic differences, speciation and extinction. Catherine Badgley and Gerald Smith of the Museum of Paleontology, at the University of Michigan, Ann Arbor, used the distributions of fish and mammals today as well as in the fossil record across North America. They predicted that landscape heterogeneity resulting from tectonic events and climate changes would affect speciation and extinction rates, but their predictions played out quite differently for each group, depending on the tectonic activity and climate changes of a region. The Mississippi River basin, for example, is flat, lying at a low elevation, and not tectonically active, which gives rise to an intricate network of long streams with separate headwaters. That separation provides relatively isolated habitats for fish populations. That isolation allows local fish populations to diverge genetically  or even become entirely different species. But the streams remain connected enough so that if one population disappears, another can easily swim upstream and take over that newly available habitat. So, Badgley says, "little extinction has occurred in this region, prior to human influences." 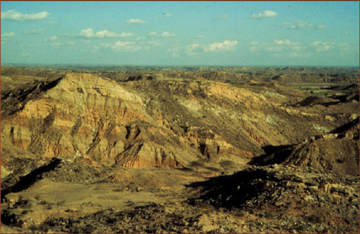 Habitats for mammals in a large floodplain in Pakistan Habitats, represented by Miocene sediments from the Siwalik Group (pictured here), persisted for millions of years, shifting only because of long-term climate change. Because the landscape was homogenous and long-lasting, its resident mammals had low rates of speciation and extinction. Photo by Catherine Badgley. In this setting, the team found high numbers of fish species, but relatively few mammal species. For mammals, most of the eastern United States is one big homogenous habitat, Badgley says. "If a local population goes extinct, it's easy to recolonize from a population that's one or two states away." That gives rise to fewer mammal speciation and extinction events in the Mississippi basin. The opposite scenario applies to the tectonically active West, which has produced short rivers, with very low connectedness, Smith says, and for fish in the West, extinction is rarely followed by recolonization. But, Badgley says, mammals have a branching network of mountain and desert habitats, and Pleistocene climate changes have increased their connections. As ice advanced during glacial periods, colder habitats that are now isolated on mountaintops expanded, allowing various species to mingle now and again, yet isolating them enough in colder periods that they could evolve or differentiate genetically. Over millions of years, mammal species blossomed in this landscape. Badgley and Smith's hypothesis predicts that genetic differentiation between mammal populations should be greater in mountains than on the plains, as illustrated by a study of populations of pocket gophers in Mexico that matched this prediction. The work, says John Damuth, a paleontologist at the University of California, Santa Barbara, shows "the potential for a high predictive capability for tectonics and climate change. You can get a long ways just looking at those alone." However, Damuth, who has worked with Badgley in the past, says this is "not that unexpected," though the model's success hints that such processes are not as secondary as some scientists have assumed in the past. The team presented their predictions to SVP on Oct. 18; though Badgley's data on mammals have been published, Smith's fish data have not.